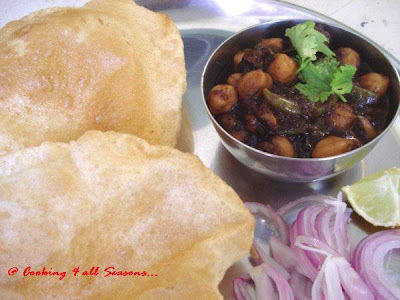 Cooking 4 all Seasons: Punjabi Chhole ~ the authentic way! Memories jog down fast when you least expect them to, openings gates to long forgot days, happily spent with no care or want. I haste to capture them all in one move, lest I forget! But I guess its bound to happen. The mind is so full of memories, that at times I wonder how one is able to keep pace with it. Better part of my life, I tried recording them in dairies, but life takes a different path each year, that I have never been able to keep up with my writing. I guess this blog has been my best option in trying to record certain daily things or those fond memories. But its so funny yet strange, that almost all of them are related to food! One such beautiful memory weaves around a Punjabi Chhole, that I ate years back! It was a cold winter Christmas time, it was colder, because we were on a vacation in Bombay. It was my first trip to Bombay and I loved every minute of it. We went there to attend a wedding ceremony of Dad colleague's son. The trip and those 4 days will remain forever fresh in my memory. I need no dairy to itch them down. From the moment I stepped down the train that early morning in Pune, to the time I got on the train back to Madras, its all still so fresh in memory. The drama that unfolded in a typical Punjabi wedding, was too good to be missed for anything. Their culture, their customs, and to top everything, their food, god I simply loved every single part of it. There I was, about to get down the train, I can still feel the cold breeze that hit me sharp. It was 4 in the morning and it felt strange, because for me to feel cold, it must have been a really a cold morning. You don't get to have such cold days in Madras. We spent four wonderful days, enjoying every single moment. The account of that beautiful wedding among other things, will make many posts. I will limit myself to that memory of Punjabi Chhole that stands out the most! We started for Shiridi Sai Baba temple early in the morning and after a good darshan, started back. The journey back led us through rural rustic villages, paving way into deep dry landscapes. For all it was cold, the midday was so very hot. We were panting with breathlessness, though all we was doing, was just jostling along the car. The journey seemed endless, and we were exhausted just traveling. We had to stop for a break and what better place than a Punjabi dhaba! Ah, that scene unfolds now in my mind and I am transported back to that day in one hot afternoon, all set to devour a roti dipping longingly into that katori full of Punjabi Chhole! It was a black gravy with shy channa peeping out all over it. No where else have I tasted a dish so earthly! It tasted of its land and the soil. Later I found that most authentic punjabi Chholes are mostly black in colour and its mostly due to the roasting of the wholes spices. I got back with loads of memories of that one meal, happy to keep me going for many years. I have since tried recreating that Punjabi chhole, had asked many punju friends. Then I came across an old torn cookbook, which had some authentic recipes written down it. I have since bookmarked many to try. Though this Punjabi Chhole, topped the list. When I finally got down to making it, it was worth all the wait. Yes, one bite on the chhole, and I was magically taken back to that afternoon. I have always been making chholes, I must have tried many versions. The change in this was, that I roasted it to almost to blackness and the addition of Black Cardamom. This is the first time I am using Black Cardamom. Green cardamom is very common in my kitchen. So using this black cardamom, changed lot of things. As usual, when I searched a bit on black Cardamom, I was happy knowing so many details about this spice. Black Cardamom (Amomum subulatum): In Hindi, it is called " Bari illaichi " (Big Card amom) or " Kali illaichi " (Black Cardamom). The plants are grown in Eastern Himalayan region (Nepal and Sikkim). It is used in making Curries. Black Cardamom are large, hard, black-brown, wrinkled pods and it smells more like burnt rubber. It is a very pungent odour, with a strong camphor smell. Its mostly used in the robust stews and meat dishes. In these recipes, pods are crushed and allowed to simmer with the rest of the ingredients. It takes only a few to give any dish a rustic, smoky flavour. When I saw this chhole calls for 4 black cardamom, I knew its going to be different! Soak the channa overnight in enough water. Remember that it almost doubles, so add enough water and use a big vessel. Else you can soak Chhole in hot water for couple of hours and then add soda along with it when cooking. I normally don't add soda for cooking it. Next morning, you will see a white layer formed, discard it and wash well couple of times. Pressure cook it for 4 -5 whistles. You can add a quarter tsp of salt along with channa while you pressure cook it. This way, you get the salt into the channa. Some say it doesn't cook well when you add salt, but I have never seen it. 4-5 whistles should work out, else check and make sure, when you press down a chhole, it gets mashed softly! I don't like to chew on a hard chhole. Take a heavy bottom kadai. Roast all the ingredients listed under masala, together. Keep tossing it constantly, else it will get burnt. Doing this on high flame, gets this done fast, so have an eye on that. The recipe asked it to be almost black, I didn't want to take chances, so tossed it well. Let it cool and grind to a smooth powder. Heat oil in the same pan, add the grated ginger. Then add the finely chopped onions. Cook on medium till its brown. Now add the tomatoes. I normally add salt at this stage as this will get the tomatoes get mushy fast. Fry till the oil separates. This takes about 10 mins or so. Once the mix is well cooked, add the fresh ground spice masala, garam masala and red chilli powder. Mix well and cook for 2 mins. Then add the slit green chillies and stir for a few mins. You can remove the green chillies, if you want, I left it as such. Add the cooked chhole. Adjust the salt. Add about 1 glass of water. This of course depends on how thick you want your chhole, hubby dear doesn't like running gravies, so I always make it thick. Cook on high for 2 mins and then simmer for 15- 20 minutes, stirring every now and then. Else you can pressure cook again for 1-2 whistles. 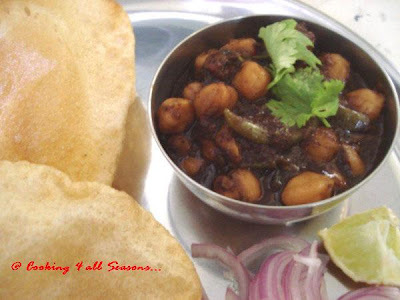 Garnish with onion and serve hot with Pooris or Bhatura. This goes to Anh of Food Lover's Journey, who is hosting this week's edition of Weekend Herb Blogging, an event started by Kalyn. Update: There seem to be some confusion on whose recipe this is. I don't claim authority on this. I got it from a cookbook, which as I have said in this comment that it is no longer with me. I don't have to credit a person when it was not inspired by the said person.